The contents of that box could be toxic. If you're wondering if your cat's litter is toxic, the answer is "probably." Some are and some aren't, so you have to do a little investigating to see how safe your litter is. If it's toxic, it could potentially pose a health risk to you and your pets. The fact of the matter is, some litters are toxic while others aren't. The quickest way to determine the toxicity is to read any warnings on the box -- if they tell you to go to a hospital if you swallow the litter, it's good and toxic. If you want to get a little more in-depth, though, check the ingredients. Silica, for example, is a chemical commonly found in cat litters. While it's virtually harmless on its own, it can be toxic when consumed in large doses. While most cat litters and the things buried in them are toxic only when eaten -- and hopefully that isn't a problem for you -- some people need to avoid them altogether. Pregnant women are susceptible to toxoplasmosis, a nasty virus that can threaten the health of their unborn children. With that in mind, pregnant women sharing a household with a cat should never change the litter themselves and should even limit their contact with Kitty. Even the litter that the cat retains in its paws and tracks around the house can be dangerous. Dogs sometimes have questionable tastes. If your pooch treats the litter box like his own personal treat-vending machine, put a stop to it immediately. Not only is it gross -- think about all those kisses he gives you -- but it can be toxic for him. When eaten consistently or in large quantities, cat litter is toxic for doggies; it can cause serious intestinal distress. Keeping the litter box out of your dog's reach is good for his health. And his breath. If you're concerned about the toxicity of your cat's litter, you have natural, nontoxic options for filling the cat box. Natural cat litters made with cedar, wheat or corn may not always have the clumping and odor-blocking power of a chemically enhanced litter, but that's the tradeoff for not filling the litter box with mild toxins. If you make the switch to natural litter, sprinkle in some baking soda for a natural odor blocker. American Kennel Club: Cats and Dogs Together: Can They Really Get Along? 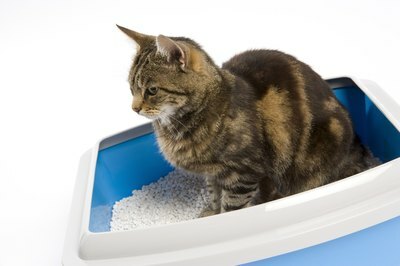 Can Sand Be Used in Cat Litter Boxes? Are the Fumes From Litter Boxes Toxic to Humans? Could a Dog Die If it Ate Cat Poop?